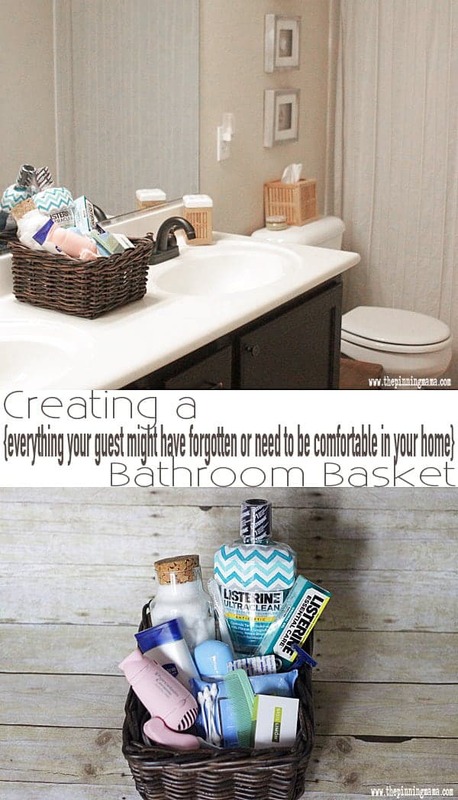 Having a guest basket for the bathroom will make your visitors feel comfortable and welcome in your home! Get the full list of what to include plus a free printable welcome note below! In my life before kids I traveled a lot. I mean a lot. Even though the travel was for business so I didn’t often get to play tourist, I still loved seeing new cities and experiencing the local culture, flavors, climate and landscape. I loved always having crisp sheets and fresh fluffy towels. Travel also has its downsides though. You are gone from family and friends and miss countless events. There is never the comfort of returning to your own comfortable bed. There is a lot of time spent in uncomfortable airports and lots of of lonely meals with gourmet selections from the airport food court. The worst part of travel though is when you open your suitcase and forgot to pack something. Travel already has so many changes that a girl just wants her own face cleanser and mouth wash. You might be able to go to the store and pick up more, but you might not have a car, or it could be too late. During my days traveling I found that some hotels were better about having these little extras than others and it made a huge difference when I needed it! Now I spend almost all of my time at home, we live far from family, and we happen to live in a destination city, we have more house guests than ever. I feel like the hotel owner some days rather than the guest! From all my travel experience I know there are several things that make guests feel much more comfortable so I have tried to take those and incorporate them into my home. 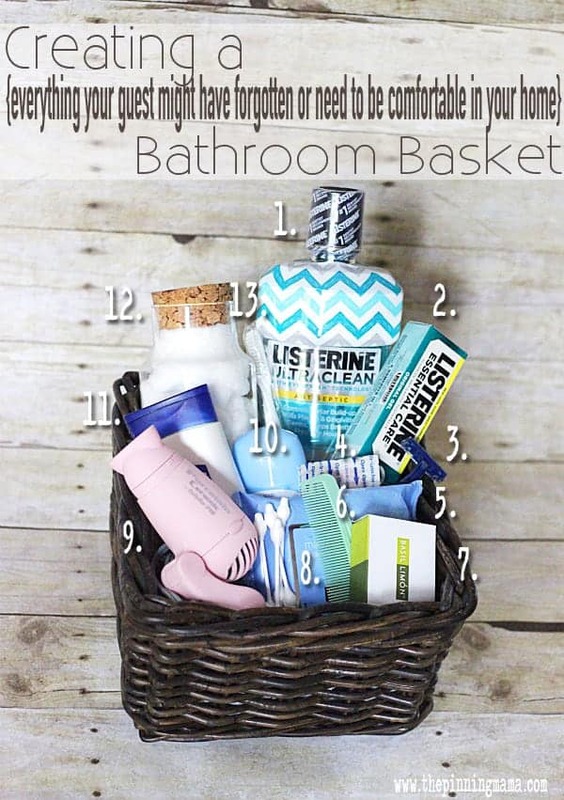 One of my favorite ways to welcome them is by having a basket in the bathroom filled with things that they might have either forgotten, or been too cumbersome to pack. I also like to add some of my favorite things that might be a treat for my guests to try. The great thing about having a basket is that you can match your decor so it looks great and be left out all the time. If you need to clean or prefer to have it out of the way, you can easily move it from the counter to inside the cabinets or in a linen closet. Plus, it is filled with things you already use daily so if you run out of something you always have a back up! 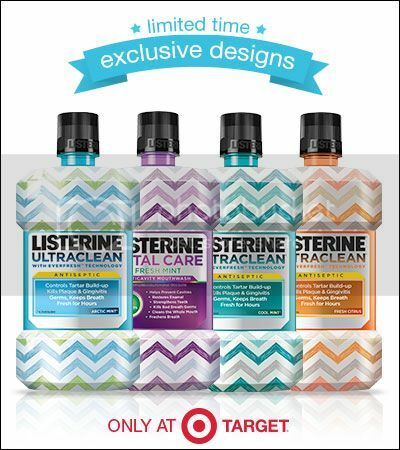 The star of my basket is the super cute chevron patterned Listerine. If I am going to have this sitting out on the counter it needs to look good, and what is more in style right now than chevron?! These are available for a limited time exclusively at Target and you can even Save Now with Target Cartwheel (my fav!) so grab a bottle for you and one for the guest basket. I like to include brands I love and that are good quality and since Listerine is the #1 recommended brand by denstists for a cleaner and healthier mouth it not only looks great but is a great option for me and my guests. Listerine – Who doesn’t want to use a little mouth wash after traveling all day? Plus it is great to rinse with after waking up since I will be seeing more than just family first thing in the morning when guests are in town. I picked the Cool Mint flavor because it matches the color scheme of my bathroom, they have several other flavor and color combos you can see here! Brand new bar of soap – It is nice to know you have a new bar of soap to use in someone’s home! Really, the options could be a little bit endless! Having these things for your guests makes them feel more comfortable, and avoids them feeling awkward if they need to ask for things. I also like to personalize a little note for my guest and leave it on the counter with the basket so that they know they are welcome and we want them to be comfortable! You can see an example of what I leave below, although in real life I would hand write the note with our guests names. I also made some free printable stationary for you to download that matches the Listerine bottle and brings the whole design together! Scroll to the bottom to download your free chevron stationary to leave your guests a note on! « 10 MORE Blogs to Follow for Awesome Silhouette Project Ideas and Inspiration! I love this idea. Thank you for the list and the welcoming note. I am trying to make my home more hospitable and welcoming and this idea will help. Thank you. Hi Kimber! What a wonderful idea and I especially love the note! Great inspiration to tuck away for holiday guests!! 🙂 Thanks so much for sharing and pinning – have a happy weekend! Thanks so much Ashley! I really appreciate you stopping by! I LOVE your idea of a guest basket. You have thought of everything. I love all the great colors of Listerine labels. Perfect for any bathroom or style. Thanks for the inspiration. My visitors will be thanking YOU. Thanks Meegan! It is something so easy and simple but also something that your guests always remember! I love it when the little things make the difference, don’t you!? Awesome idea – I love the basket you created! Thanks Layne! I hope that you are able to make one for your home and that your guests enjoy it as much as mine! I love using baskets to store things in. 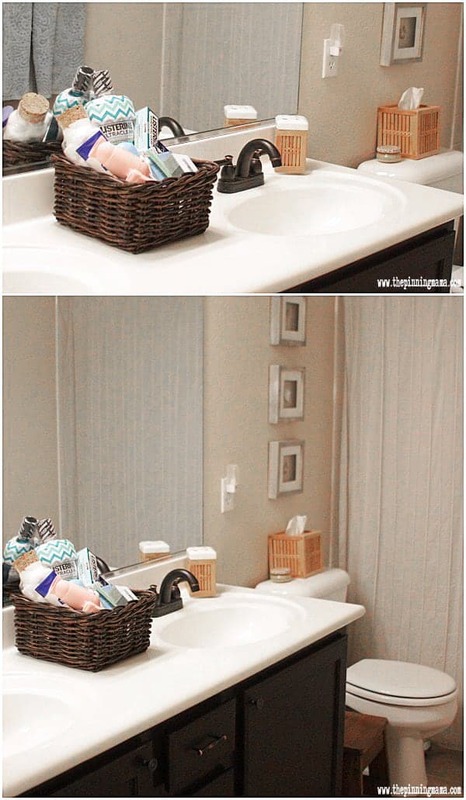 What a great idea to have a basket ready for guests! I love the printable note too. Pinned! Thanks Kara! I really appreciate the kind words. I hope your guests enjoy having a little something special waiting on them! This is such a great idea! We do something similar on a smaller scale. It is always nice as a guest to not have to worry about bothering your host/hostess for things you may need. Big or small I think it is the gesture that counts most. Thanks for stopping by Laura! I love having a guest basket! It is so welcoming. Love the idea of a printable too! Hope the printable is helpful! I know guests always love it when they feel welcomed! Such a great idea! Love staying at people’s homes where they do special things like this!! I need to be better about it myself! It is nice huh? I always enjoy feeling pampered and sometimes it is the little things!